Whilst delivering statistical consultancy to one of our clients, we designed a clincial trial with five treatment arms: three were various doses of the active compound, one arm was a positive control and the final arm was a negative control. It was desired to have an unequal allocation to treatment with the following ratio: 3:3:3:2:2. The sample size was 234 patients, to be enrolled at two sites, and patients were additionally stratified according to a baseline (binary) characteristic. An interim analysis was planned, and we needed to ensure that at any snapshot in time, the allocation ratio adhered to the 3:3:3:2:2 as closely as possible. This poster examines why we would want to have unequal allocation to treatment in the first place, and how to go about performing a randomization in clinical trials such that for any interim snapshot of the data, we could ensure as balanced as possible allocation overall. 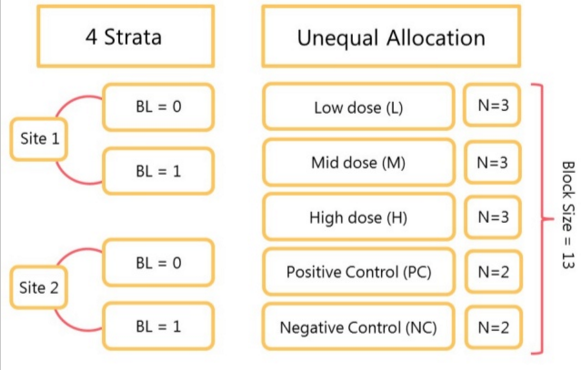 Unbalanced allocations to treatment are rarely employed within randomised clinical trials (e.g. only 2.3% of studies in the MEDLINE database from 1991-1995) as normally equipoise is assumed in that there is sufficient uncertainty of whether one treatment arm is superior to another (Avins, 1998). Anticipated higher drop out rate in one group (thereby enhancing the power for a per-protocol analysis) (Dumville, 2006). A randomisation was required for a Phase 2 proof of concept study with 5 arms in a 3:3:3:2:2 allocation. Sample size calculations indicated that a total of 234 subjects should be enrolled (54:54:54:36:36). The randomisation was to be stratified by site and a binary baseline (BL) characteristic (i.e. 4 strata) so that at any one snapshot of time, the allocation should be as close to 3:3:3:2:2 as possible, overall and within strata. An interim analysis (IA) was planned at 50% completed subjects. Randomisation part 2: Within each sub-block, randomise the order of each treatment (L, M, H, PC and NC). 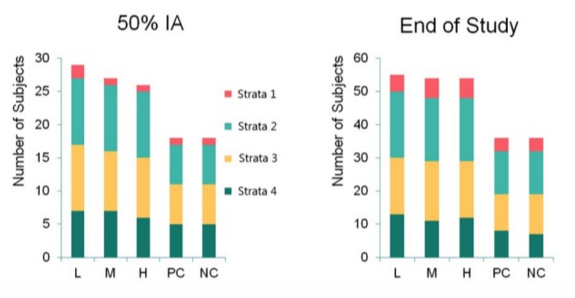 IA and end of study analyses were performed with 118 patients and 235 patients (1 was a replacement), respectively. The allocation achieved was close to the expected allocation to active dose and control groups at interim (27 and 18, respectively) and end of study (54 and 36, respectively). Although not possible using in-house standard randomisation systems at the client, the above is easily programmed within SAS. Once performed, the final randomisation was uploaded into the client system. Randomisation lists were cascaded to the pharmacy at the sites, where treatment was prepared for administration as and when required (minimising overage). The randomisation lists made provision for 234 within each strata, should only one of the four strata be able to recruit. The above could easily and simply be extended to later phase studies, where product is already prepared and sat on the shelf. Seemingly complicated designs with unbalanced allocation ratios, can be broken down into smaller size tasks. By simplifying the 3:3:3:2:2 allocation ratio into 3 more manageable sub-blocks, and randomising the order these 3 sub-blocks come in, within the main block, ensures that at any snapshot in time, within and across strata, the allocation ratio would be adhered to as closely as possible. Avins, AL. 1998. Can unequal be more fair? Ethics, subject allocation, and randomised clinical trials. J Med Ethics; 24:401-408. Pocock, SJ. 1983. Clinical trials: a practical approach. Chichester: John Wiley & Sons Ltd.